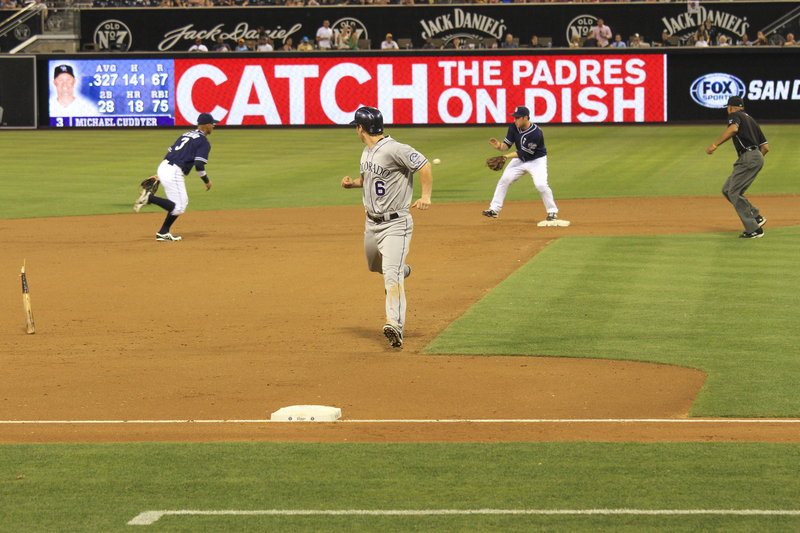 Colorado Rockies Left Fielder Corey Dickerson narrowly misses a collision with a broken bat as he races to third base in last night’s match with the San Diego Padres at Petco Park. The monkey and Mrs. Kongo took in the game, the first they’d seen this year, on a warm, beautiful evening in downtown San Diego. While Corey safely made it to third base, the broken bat forced an out at second. A swing and a miss. One of the few photos Kongo took last night that actually captured the fast ball in flight. 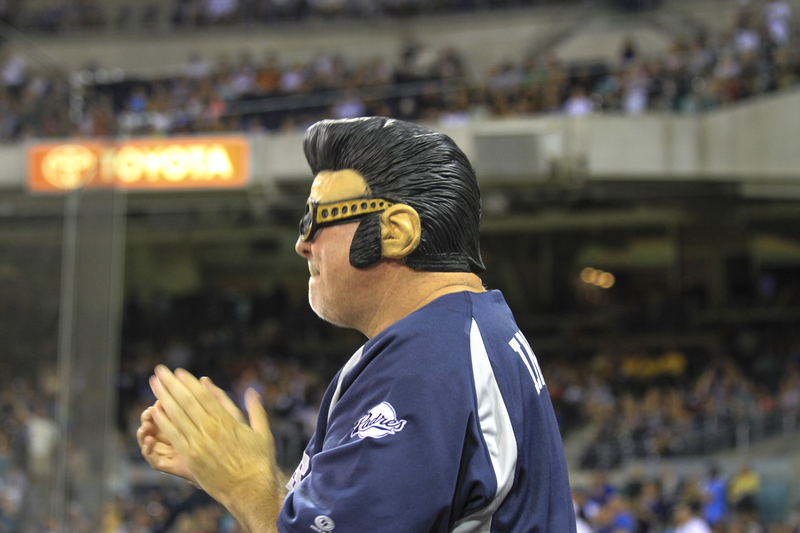 Elvis lives and continues to sing on as a Padre fan. Who knew? The Padres won, 2-1. San Diego remains 19 games behind the Dodgers in the National League West division. The poor Padres are not going to be part of the “Boys of October” this year. But for San Diego, there’s always next year. That’s pretty much their team motto. Nice shots. Did they let you in with your DSLR and telephotos? 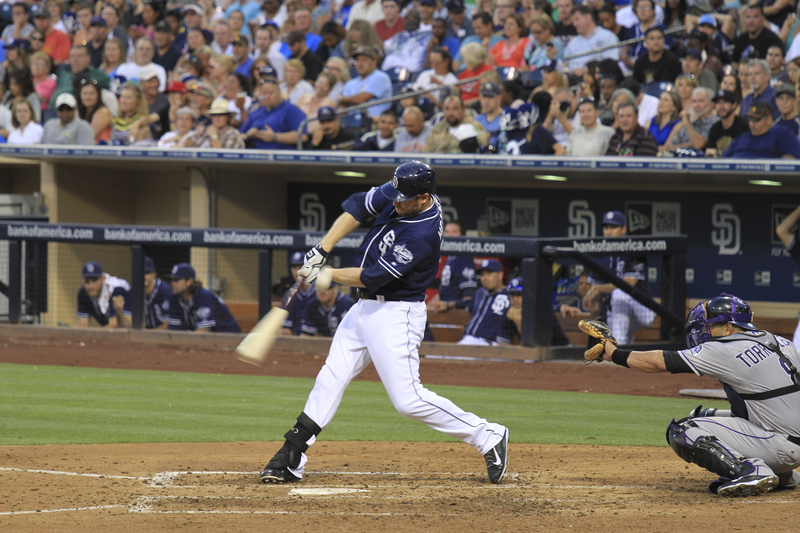 Incidentally, I was outside Petco this very night shooting the stadium (didn’t turn out so well) as well as Gaslamp. Hi, Mark. Thanks for the comments. Nobody even blinked about lugging in the camera with the 70-200 white lens. Lucky you. I got hassled the last time I brought in my NEX-3 with kit lens into the MGM Grand Garden Arena for a concert.